For the next six weeks, graduates and friends of the Clarion Science Fiction and Fantasy Writers' Workshop will be raising money to support Clarion, a workshop that has produced many well-known writers, primarily in the sf/f genre. Clarion grads include two of my own Clarion teachers—Robert Crais and Kim Stanley Robinson—as well as notables such as Tobias Bucknell, Octavia Butler, Ted Chiang, Cory Doctorow, Gregory Frost...and on and on through the alphabet. During the Write-a-Thon, you can support the Clarion workshop—and ensure its continued production of awesome sf/f writers—in any of several ways. Sign up as a writer and collect pledges and donations in your name. The process is simple, and making public your writing-related goals for the summer is a great motivator to actually work on and complete your projects. Interested? Learn more or sign up here. Donate directly to Clarion. Go here and click on the green button. Sponsor me and my summer project. 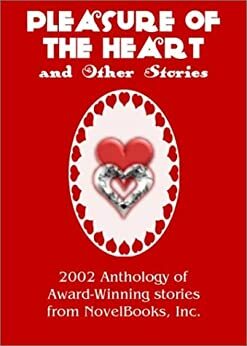 My project for the Write-a-Thon is to write two short stories. To make a pledge or donation to encourage me, sign up here. Sponsor writers you know or admire who are participating in the Write-a-Thon. The list of writers who have signed up is here. You can click on each person's name to find out something about them and what project they are doing during the Write-a-Thon. If you want to support several writers, Clarion has made the process simple. Start here. Buy Clarion swag. Go here and here to find teeshirts, mugs, hats, and other stuff. No time? No money? Spread the word through your social media: blogs, Websites, Twitter accounts, Facebook page, or whatever else you do. You can grab some cool Write-a-Thon badges here. 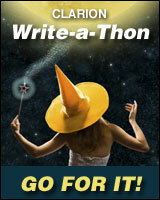 Clarion's goal for this Write-a-Thon is to sign up at least 225 writers and to collect donations of at least $18,000. Donations go to support the workshop in general and to scholarships to help students who otherwise could not afford to attend Clarion. Donations are tax deductible if you itemize deductions on your U.S. federal tax form for 2013, to the extent allowed by law. Clarion's sister workshop, Clarion West, will be running its own Write-a-Thon at the same time, 23 June to 3 August. You can sign up as a writer, see who has already signed up, or donate directly to one or multiple writers here. Thank you for reading this post and for helping the Clarion workshops in any way you can. Congratulations, Sophia Rose and Cyn209! You are the two winners of a Kindle or Nook ebook of Like Mayflies in a Stream in the Summer Banquet Blog Hop contest of last week. I've already sent emails to both winners. If you are a winner and didn't receive an email from me, please let me know how to contact you. 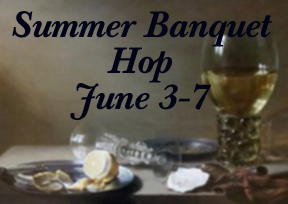 This blog post is part of the Summer Banquet Blog Hop, in which 31 authors of historical fiction blog about historical food in the first week of June. 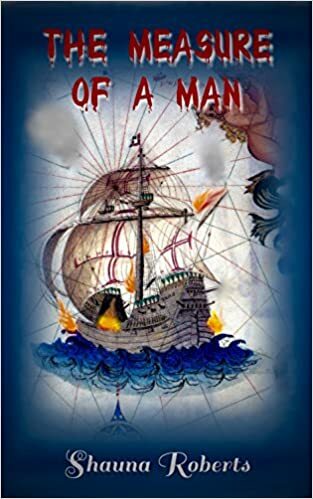 The following authors are taking part; click on a name to see that person's post. Many of the Summer Blog Hoppers are also offering prizes, including me. 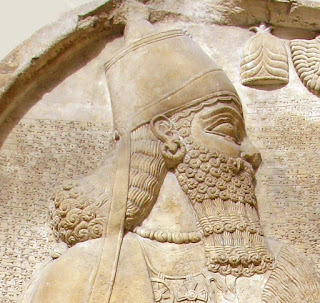 To enter to win one of two Kindle or Nook versions of my historical novel Like Mayflies in a Stream, set in ancient Mesopotamia, comment below or like my Facebook author page at https://www.facebook.com/pages/Shauna-Roberts-author/194876117254102?ref=hl. Winners of prizes at all blogs will be announced on 10 June 2013.